A Green Mushroom: Excited For StarCraft 2? 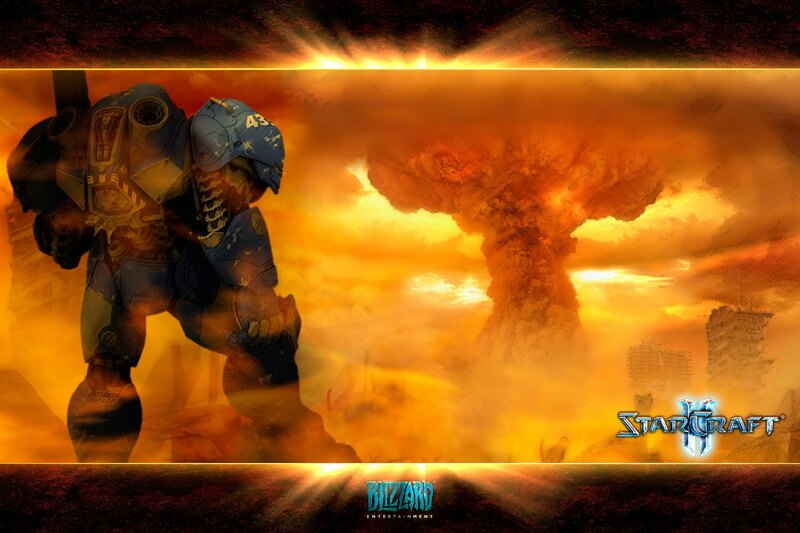 I'm so excited for StarCraft 2! I can't remember the last time I was this pumped up for a game release. But Spinks isn't impressed. She wrote on her experience trying out the StarCraft 2 beta and the reasons she wasn't impressed. Her points are completely valid. The beta was entirely multiplayer focused and she says that she lost every game. I can understand how that would be extremely frustrating. Because of her post I've decided to talk about some of the other features in StarCraft 2 that might appeal to those who haven't been impressed so far. The single player campaign is made by Blizzard. I haven't played it yet (no one has) but Blizzard has a great pedigree for story in their real time strategy games. They have a long history of polishing their games until they shine. The single player campaign also has a variety of difficulty settings so that everyone can enjoy it, even RTS newbies. It won't be brutal the way that the online multiplayer can be on ocassion. Also, cooperative play vs AI. A player (and a group of their friends) can play together against AI opponents of their choosing. The number of opponents and their difficulty level can be changed by the players. I think this will appeal to people who would rather play cooperatively instead of competitively. Custom games are amazing. Some of the variations that people come up with don't even resemble the main StarCraft 2 game but are astounding in their own right. There are so many fun creative game types out already and the game isn't even out of beta yet. Custom games from StarCraft 1 and WarCraft 3 have gone on to spawn new genres and I expect to see more genres emerge with the release of StarCraft 2. Coming back around to multiplayer, I really want to emphasize that the beta player pool was small. Not only was it small, but most of the players are people who already have a ton of experience with Blizzard RTS games, which gives them a huge advantage. Once the game releases to the general public then the player base will greatly expand and the matchmaking will work much better. The matchmaking system they've designed is impressive because it's designed so that every player can play against people of a similar skill level, even newbies. Maybe I've piqued some of your interest. I hope I have. But, if you don't like Blizzard, PC, or RTS games then StarCraft 2 still might not be for you. I like RTS games well enough, but I was never inspired to play more of Starcraft than a single playthrough of the single player game. It just wasn't that great, IMO. As a result, I have no real interest in playing the sequel. It's similar to how I feel about Infamous 2 - there are too many excellent games out there for me to jump on sequels to games that I feel are mundane. I know a lot of people in a similar position. People who really like one facet of Blizzard games but aren't impressed by the others. As long as you know what you like there's nothing wrong with that at all. I'm excited for Diablo 3 too. I think all of Blizzard's games keep getting better with time, their only game I'm not extremely excited for is Cataclysm. Maybe it will be revolutionary, but at this point it looks like more of the same. I have seen a lot of negativity about the Starcraft 2 beta due to it's multiplayer nature. I can understand the disappointment for those players who want a solo or for coop vs A.I. play. At the same time, I think they came off with the wrong impression. If you look at the patch notes, every change was for balancing out units and macromanagement for fair play. Balancing in games is the most critical in multiplayer and that is where I believe the beta was focused on. I don't have any doubt that Blizzard will put together a fantastic campaign. Furthermore, the editor they have put out for custom games is pretty amazing, so the fun custom games will no doubt follow once the modders get access to the full array of units, heroes, and items. So perhaps it is worth waiting for those who desire only those things, but I believe they will he putting out a game appealing to a lit of RTS players.